Speaking a foreign language can be even more frustrating. And by the same token, speaking your own language in a foreign country brings its own set of challenges. Take P. for example. Do you think that he would actually correct my English when I make mistakes? Of course not! Or sometimes he does, but most of the time he does not and, hmmmm, I just wonder why. In any case, you soon realize that living in a foreign country where you speak another language, and not use your mother language as often as you wish can create situations in which you can speak a very funny (funny weird) language. You somehow develop your own, and use it to communicate with the expats from your country. My example is the following: my French friends and I can become what I call language lazy. We speak a franglais defined by us. Not finding a word in French? Pas de problème, let’s just use the English one, everyone understands. In reality the real culprit is your memory. When you do not use a word or expression, you tend to forget about it, or rather, it goes safely to have a wee sleep in what is called the passive memory. On the other hand, the active memory deals with every day words, the ones you will not forget because you use them a lot. I am lucky though. Working in languages for so many years allowed me to stay sane.Yet it can be hard and tiring. What is the English word for the French la sole? Love it! Those examples are the best! It occurs often that P. asks about the French translation of an English word and bingo, it ends up being the same! Béa: – Béa, how do you say tulip in French ? Of course in the food industry, this happens more often than in other areas. No complaints, all the more as learning the names of fish in English has always been a nightmare for me. I just have a hard time remembering those (I should really use flash cards). I often go to a restaurant and find myself seeing fish names on the menu without having the slighest clue as to what they are. Friends help of course (aren’t they nice!) and try to give me graphic descriptions of the fish’s looks, but it does not always work to fulfill the gap made by the missing word. In France, Roulades are a very common way to prepare fish or thinly cut meat (it is also sometimes referred to as paupiettes). Fillings are usually placed inside the rolled shape. I like sole for roulades because of its delicate texture, as sole fillets are thin (keep in mind that: fillet– English spelling, filet– French spelling). Why do we call them roulade (roo-LAHD)? rouleau (n. m.) = a roll. rouler (v.) = to roll. Using the same root, we made roulade! 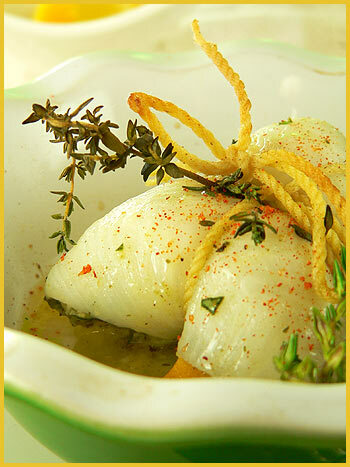 I remember family dinners where we would have roulades de sole served in a creamy sauce. The fish was usually cooked in a court bouillon first (basically a fish stock). I decided to twist the typical preparation. Instead of cooking the soles in a fish broth, I simply baked them in the oven with lemon and herbs. This recipe is simple and takes no time. That is a real bonus. All you need is a bit of cooking string and have fun making those knots! It surely brings the manual side in all of us. Take a mortar and in it, crush the peeled garlic cloves with a dash of coarse sea salt. Add the basil leaves, the pine nuts. Continue to crush and then add the olive oil (3 tbsp or so). The consistency should not be too thick. Place your soles on a wooden board and sprinkle pepper on both sides. On one side, brush some of your pesto. Place two thin slices of lemon on the fish, rolll it and tie it as if to tie a package. The strings describe a cross at the top and bottom of the rolled fish. 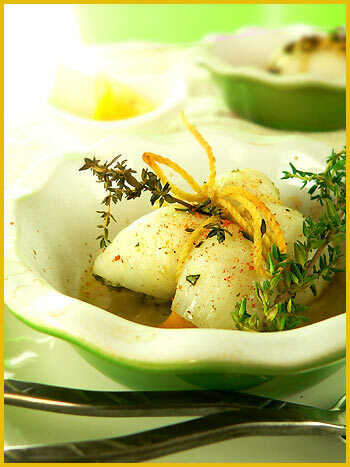 Place the fish roulades in an oven dish brushed with olive oil. Place a piece of thyme on top of each roulade and then pour a dash of olive oil. Place in a preheated oven at 400 F for about 15 min. What a beautiful and entertaining post. How you can even keep all the words together I’ll never know! 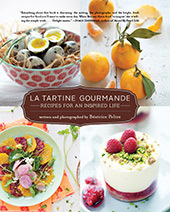 But I do feel like I am not only getting great French lessons from you but also wonderful recipes! I must say that I am embarrassed that I have let my Spanish get so rusty. I think I need to visit Spain again. Yes, that’s it! As always, such gorgeous photos. You are my idol, you know that, don’t you? Super votre blog, les photos sont belles et les recettes originales. En cherchant une recette de dessert vietnamien, je suis passée par stationgourmande.canalblog.com et j’arrive chez vous. La cuisine nous fait voyager !!! Grand plaisir à lire la vie des français d’ailleurs. Bravo et merci. Ca doit etre terriblement delicieux, surtout avec une si belle photo. Great post! After living in Europe for 10 years, I could hardly speak to people when I moved back to the US. Not only were the words and phrases mixed up with several other languages, but I had missed out on a whole new set of slang phrases that I neither understood nor could use. And most people thought my odd mixture of English and other languages was either cute or funny – so corrections were rare. Beautiful pictures and creative food ideas! Anyway, merci beaucoup pour les photos magnifiques et pour la recette aussi! The recipe is beautiful, and the flavour… I imagine. Rhôooooooo quelle photo ! And I love sole. It’s one of my favourite fish. I’ve bought basil yesterday as the spring has finally come ! Temperatures are higher. I have got all I need to make this recipe ! great ! your food styling is so impressive. you make the roulade look so easy! C’etait pareil pour moi, quand je vivais en France. Au bout de trois ans, certes je possedais encore ce vieux couteau de langue maternelle, mais il etait bien ebreche. En plus j’affirme ma solidarite avec Philippe. On ne saurait >, si c’est bien le mot, l’orchidee rare qu’est l’anglais de votre blog. Comme Hannibal Lector l’a bien dit dans le Silence des Agneaux, le monde serait moins savoureux sans cela. Superbe photo , superbe recette anecdote très intéressante sur le fonctionnement de la mémoire des mots et les approporiations linguistiques!I used to speak a good english as I wa living in London, but I nearly forgot all of it ! that’s life!!! As always so beautiful! I love sole. We don’t eat it as often as I would like. But we always tend to have it at holidays in a dish we call fritto misto which is an assortment of fish that are fried. This looks so refreshing … I must give it a try! Wow Bea! I love how the presentation of this dish…it looks so inviting! I know what you mean about the ‘language’ thing. My husband speaks mainly english to me, but I tend to speak italinglese. It certainly doesn’t help with my learning skills! You made beautiful fish! I feel like to have a glass of white wine to go with it now! Your roulade looks extremely tempting Bea!! 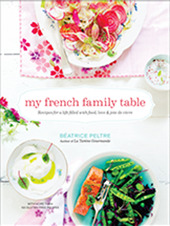 Like Genevieve, I also love your fantastic styling and the beautiful range of crockery and props you use. Great stuff! Your dish looks marvelous, Bea. I feel your pain re: languages. I can’t tell you the trouble I’ve gotten myself into with French and Italian. By the way, do you know if there’s any difference between a French roulade and an Italian involtini? I love this post and the recipe! You are sooo right. My South African friend decided to make dinner for us when we were in Germany. She queued up for a long time to buy rump steak because she did not know what it was called in German. When her turn came, she made a mooing sound and slapped her bum. Everyone cracked up but she got her rump steak. And realised that in German, it is spelt … rump steak, just pronounced different. LOL. Matt, thank you! 😉 I would only encourage you to go to Spain yesyesyes!Travel is the best thing! Ahah, your idol, I think I have a lot to learn from you! Bonjour Irène, Merci de votre gentil message, je suis heureuse qu’il vous plaise. Au plaisir d’une prochaine fois! Le blog d’Anne est superbe! Surfindaave, thanks. I bet it must have been confusing after 10 years! I totally relate! Emilyk, ah yes I can imagine it must be the same experience for you! Nature takes its course and it is good to be able to use that damn mother tongue! Fabienne, yes fish names are terrible, aren’t they?? Same with trees! Thalie, merci. Heureuse que ca te plaise! Papilles, I look forward to knowing whether you like it! Genevieve, thanks for your sweet note! Trust me, it is easy to make roulades! Ben, ahahah, non mais alors, tu soutiens P. comme cela! Je suis sûre que vous faites tous les deux exprès de me dire des expressions qui n’existent pas! 😉 Coquins! Gattina, ahahh, yes the wine is a great idea! I want one to now! Camille, ah mais trop gentil ton message. Je pense la même chose de tes bons gâteaux! Miam! Bron, thank you!!! Too sweet of you too. Rob, ah if on top there are two! 😉 Italian and French! I also have Spanish but for some reason, this one is ok. Probably because it is so close to French, latin language! Sophie, yes fish names are a killer! I somehow cannot remember, even if I say them many times! MM, funny story indeed! 😉 It gets very graphic at times! Mercotte, ah mais oui, on ne se refait pas! C’est ingrat quand même les langues étrangères. Ivonne, fritto misto, interesting. Never heard about this before! I know I’m going to love this, such a pretty presentation! Glad you like it Keiko! i bought some sole, but i forgot to get the string! Just a question? is it eay (not fussy) to cut open the string at the table, with a regular dinner knife? this looks yummy, but how does the guest, if serving this at a party, easily cut the string? You can easily cut the string with a knife.